International Launch Services (ILS) – who recently signed contracts for three new satellite launches – have launched with the BADR-5 telecommunications satellite via their veteran Proton-M launch vehicle and Breeze-M upper stage on Thursday. Lift-off from the Baikonur Cosmodrome in Kazakhstan was on schedule at 22:00 UTC, ahead of over nine hours of flight until the spacecraft was placed into orbit. The Proton booster is 4.1 m (13.5 ft) in diameter along its second and third stages, with a first stage diameter of 7.4 m (24.3 ft). Overall height of the three stages of the Proton booster is 42.3 m (138.8 ft). The first stage consists of a central tank containing the oxidizer surrounded by six outboard fuel tanks. Each fuel tank also carries one of the six RD-276 engines that provide first stage power. Total first stage vacuum-rated level thrust is 11.0 MN (2,500,000 lbf). Of conventional cylindrical design, the second stage is powered by three RD-0210 engines plus one RD-0211 engine and develops a vacuum thrust of 2.4 MN (540,000 lbf). 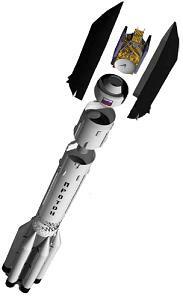 Powered by one RD-0213 engine, the third stage develops thrust of 583 kN (131,000 lbf), and a four-nozzle vernier engine that produces thrust of 31 kN (7,000 lbf). Guidance, navigation, and control of the Proton M during operation of the first three stages is carried out by a triple redundant closed-loop digital avionics system mounted in the Proton’s third stage. The Breeze-M upper stage is the Phase III variant, with Thursday’s launch being the third flight of the new configuration for the avionics bay. The Phase III upgrade uses two new high-pressure tanks (80 liters) to replace six smaller tanks, along with the relocation of command instruments towards the centre – in order to mitigate shock loads when the additional propellant tank is being jettisoned. The Proton M launch vehicle, utilizing a 5-burn Breeze M mission design, will lift off from Pad 39 at Baikonur Cosmodrome, with the BADR-5 satellite on board. The first three stages of the Proton will use a standard ascent profile to place the orbital unit (Breeze M upper stage and the BADR-5 satellite) into a sub-orbital trajectory. From this point in the mission, the Breeze M will perform planned mission maneuvers to advance the orbital unit first to a circular parking orbit, then to an intermediate orbit, followed by a transfer orbit, and finally to a geosynchronous transfer orbit. Separation of the BADR-5 satellite is scheduled to occur approximately 9 hours, 13 minutes after liftoff. BADR-5 will be co-located with BADR-4 and BADR-6 Direct-To-Home satellites at ARABSAT’s 26 degree east longitude video “hot-spot”. This newest satellite will guarantee to ARABSAT’s broadcasting customers a unique “hot” redundancy, the highest level of service provided within the MENA region. Complementary capability will include supporting the projected expansion of HD-TV broadcast and the development of sophisticated interactive services. The Eurostar E3000 platform satellite will have a separated spacecraft mass of approximately 5,420 kg (11,949 lbs), sporting 46 Ku-band transponders and 4 Ka-band transponders, with an anticipated service life of 15 years. Thales Alenia Space of Neuilly-sur-Seine, France built the satellite on behalf of EADS Astrium of Paris, France. This will be the 6th Proton Launch in 2010, the 4th ILS Proton Launch in 2010, the 60th Proton Launch for ILS, the 3rd Arabsat Launch with ILS, and the 12th Eurostar Satellite Launched on ILS Proton. ILS aren’t the best known launch company in the world – compared to the likes of Arianespace – yet they are continuing to push forward at a good pace, with customers showing their faith in their provision of the veteran Russian launcher. Contracts were recently announced for two commercial satellites, YAMAL 401 and YAMAL 402, for Russian satellite operator, Gazprom Space Systems, for launches scheduled in 2012-2013. The 3,150 kg YAMAL 401 satellite, to be launched directly into geostationary orbit will be built by Russian spacecraft manufacturer ISS Reshetnev with a Thales Alenia Space payload. The YAMAL 402 satellite will be built by Thales Alenia Space and weigh approximately 5,250 kg. YAMAL 402 will be launched into geostationary transfer orbit to provide fixed communications and transmission services over Russia, CIS, Europe, the Middle East and Africa at the orbital location of 55 degrees East longitude. Both YAMAL 400-series satellites will have an anticipated service life of 15 years. Also, just this week, ILS announced a contract had been signed for the ILS Proton launch of Telesat’s Anik G1 satellite – scheduled for the second half of 2012. Anik G1 will be launched into geostationary orbit on an ILS Proton, carrying 16 transponders operating in the extended Ku-band that will be used by Shaw Direct, a leading provider of direct-to-home satellite TV services in Canada. Anik G1 will also provide expansion and follow-on capacity at 107.3 degrees West covering South America. In addition, Anik G1 will have capacity operating in the X-band frequencies over the Americas and the Pacific Ocean- the first satellite to cover the Pacific Ocean with substantial X-band coverage. To be built by Space Systems/Loral utilizing the flight-proven 1300 platform, Anik G1 is anticipated to have a service lifetime of 15 years.